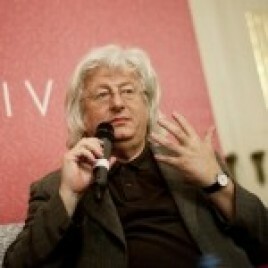 Hungarian writer born in 1950. His best known book is Celestial Harmonies: A Novel – a story of the writer’s family history, but also of the history of Hungary and Europe. Winner of the most important Hungarian literary awards, including the prestigious Kossuth Prize. His books have been translated into several dozen languages. Celestial Harmonies: A Novel, Helping Verbs of the Heart, The Transporters, The Book of Hrabal and No Art (Semmi művészet) have been published in Polish. He talked about his book Niesztuka with Jerzy Franczak on Friday, 26th October.